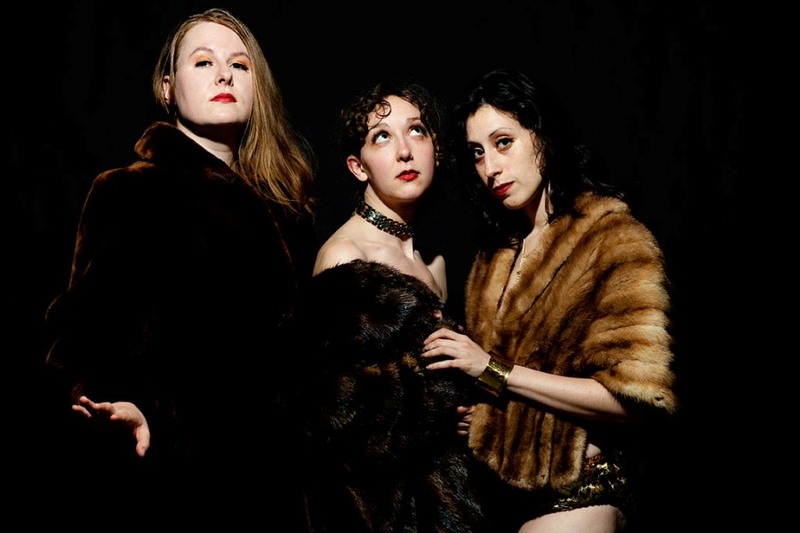 Post-modern performance trio Mad King Thomas is known for pushing boundaries and questioning limits. They skirt a thin line between dance and theater, dive into messy investigations of gender roles and power dynamics, and somehow manage to blend copious amounts of props, over-the-top costumes, and irreverence into a result that’s utterly sincere and even profound. This Saturday night the three bring their latest work, a collaboration with New Orleans-based playwright Justin Maxwell titled The Weather is Always Perfect, to the Minneapolis Sculpture Garden as part of Open Field. The piece marks the end of an era as the three performers get ready to push boundaries in yet another way: taking their nine-year collaboration long-distance. Nine years later, Mad King Thomas has remained in the Twin Cities and built an impressive list of performances, grants and awards. Their work has been presented as part of Naked Stages (2007), Momentum: New Dance Works (2011), Choreographer’s Evening (2007, 2009, 2011), the Red Eye’s New Works: 4 Weeks Festival (2008, 2009), and the Southern Theater’s New Breed series (2010), and has included dance films, vignettes, and evening-length pieces. Regardless of the form, experimentation drives the work and, as Madaus explains, also creates a safety net from artistic paralysis: “At the beginning of every new project we often say ‘it’s an experiment’ because we feel daunted by whatever the last thing was, and wonder how we can ever do anything again. I think that this, along with permission for failure, have always been helpful tools for moving us forward.” And moving to a long-distance working relationship is one more extension of their experiments. The trio recently announced that two of their three members have plans to leave the Twin Cities this fall. Thomas will move to Boston to pursue a degree in dance/movement therapy with a specialization in mental health counseling, and King to Los Angeles with her partner to experience new scenery. The three insist that they have no plans to break up: “We can’t; we have a death date,” Madaus says, referencing their joint agreement to die on stage at the age of 103, together. “But yes, [the collaboration] will look different for sure.” The agreement to stick together is one they take seriously, and has led to making a temporary work plan where they will take turns serving in month-long Artistic Director positions for the group. As Artistic Director, each will be “responsible for taking us through an artistic process that is theoretically fulfilling to the individual, and unaccountable to the others’ tastes,” Thomas says. The logistics remain flexible, but might involve written assignments and Skyped rehearsals. And fans can rest assured that there will be future Twin Cities performances– plans are in-process for a 10-year birthday celebration show next summer.